Nikolai Poliakov, known more widely as Coco the Clown, is perhaps Britain’s most famous August clown of the 20th century. He was born to a Jewish theatre family on the 5th of October, 1900, in Daugavpils, Latvia (then part of Russia and named Dvinsk). At the age of eight, he ran away from home, travelled to Belarus, and joined a circus. According to his memoirs, during the First World War, he joined the Russian army, was a corporal in the 11th Siberian Regiment and received the St George Cross. In 1929, he performed at Circus Busch in Berlin, where he was spotted by Bertram Mills’ equestrian director. His first appearance in the UK was with Bertram Mills in Manchester, during the winter of 1929-1930. By the Second World War, the entire Poliakov family had moved to the UK from Riga, where they had previously been while Nikolai was touring. At the beginning of the war, alongside his eldest son, Mikael Poliakov, Nikolai got a job digging roads for the Ascot Gas Company. During the war, he briefly served with the Auxiliary Military Pioneer Corps of the British Army. His son Mikael took a job driving for the government. Three of his daughters also helped their country: Helen joined the Women’s Auxiliary Air Force (WAAF), Olga the Auxiliary Territorial Service (ATS), and Nadia the “Women’s Land Army (WLA)”. In August 1941, Nikolai was discharged from duty on medical grounds. Alongside his youngest daughter Tamara, he then began his work with the Entertainments National Service Association (ENSA), and entertained troops throughout the war. 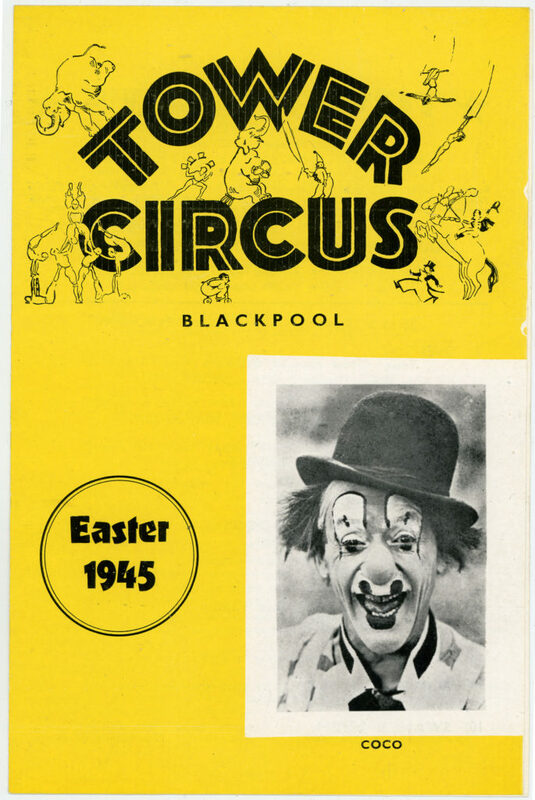 As Coco the Clown, Nikolai also performed for several seasons at the Blackpool Tower Circus, the only circus allowed to remain open during the war. Upon its reopening, he resumed his long-lasting association with Bertram Mills. In 1949, Nikolai became a naturalised British subject. In 1963, Nikolai Poliakov received the Order of the British Empire. He died on the 25th of September 1974, at 74 years of age. Poliakoff, Nicolai: Coco the Clown. London 1941; Poliakoff, Nicolai: Behind My Greasepaint. London 1950; Turner, John M.: Twentieth Century Circus People (1901-1959). Liverpool 2003; National Fairground and Circus Archives, University of Sheffield: John Turner Collection; Circopedia: Coco.